One man’s truth is another man’s heresy. In fact, for many all of us, many of our truths of yesterday are our heresies of today. Let me elaborate from my own life examples. When I was a little kid, like 4, I believed in the Boogie Monster. It didn’t help matters that my older brother (8 years older), who was put in charge of my sister and me when our parents went out for the evening, would stage an attack just outside the house after dark, complete with horrible screams, and pounding on the walls and windows. He’d even go to the trouble of smearing ketchup on his face and a tearing his shirt. When he burst through the door, he’d look all wild and freaked out. I just wanted to hide under the bed till Mom and Dad got home. As I got a little older and shed my fear of the Boogie Monster, something far more foreboding replaced it. I grew up in a major hell-fire-and-brimstone preaching church. We had revivals at least twice a year where they showed the terror-inducing, horrible movie, “A Thief in the Night,” in order to demonstrate what would happen to every person who didn’t say the sinner’s prayer before the rapture. In addition, this particular church taught that any known unconfessed sin put you back in the “unbeliever” category, which meant that if Jesus came back tonight, while you were sleeping, and you had lied that day and not told Jesus you were sorry—well, so long for eternity to a place of weeping and gnashing of teeth, sucker! I often confessed even my unknown sins, just in case. As I got even older, I realized the complete fallacy that I could “lose my salvation” over any unconfessed sin. In fact, in college, God promised me that I was legally adopted as His child and that nothing I could ever do would make Him go back on that commitment. Well, for me, that settled the matter and I never worried about being “left behind” again (sorry, Jerry). Not only that, as I began to study the whole rapture doctrine, I realized that was just another big, scary lie that started in the 1800s. As I moved through early and middle adulthood, so many of my earlier “theologies” changed, such that I am hardly the same person anymore. All that got me thinking about how we have this thing we call “orthodox truth,” as if there is this one way of thinking that we all agree is the only true way to think, yet even within ourselves we change and grow and adjust to the new truths presented before us that make the old truths not ring so true anymore. As you can see from my newest book due out this month, leaping out at you from the sidebar on my homepage, (Raising Hell: Christianity’s Most Controversial Doctrine Put Under Fire) my “truths of yesterday” have evolved dramatically. Some people may think I’ve gone off the deep end. But I believe there are others of you who realize that your questions have outgrown your teachers, and that some things just don’t add up—it is you who just may end up in the deep end with me. And that is okay. Ask any diver—it’s in the deep waters where the exciting things take place and people are transformed. Part of the reason I think truth can be so elusive is that it is dynamic and living—on the move —as you would expect from a living, breathing person. Jesus said, “I am the truth.” Truth is a Person, not a statue, a doctrine, or a list of 10 things we believe from now until Kingdom come. To follow and encounter truth, you have to be on the move. Don’t stop learning, listening, and growing. A lot of information is becoming available to people like you and me (regular Joes) that has never before been easily accessible. Not only is there a lot to learn, but there is also a lot to unlearn. A lot can happen in 2,000 years. A lot did happen. Take a journey with me and discover how great change can be! I think it’s time for all hell to break loose. Great blog. I remember seeing that movie in church as a kid. What a nightmare religion can be to children. It's like a meathook that stays put well into adulthood for most people. Those who escape from it are few and far between. But that is changing now, isn't it? God is closing down the slaughterhouses and butchering the butchers. Can't wait for the book! Truth spoken as expected Julie. I grew up with fire and brimstone preaching as well, night after night living in fear of being left behind. Praise God, He holds me firm in His hand never to be plucked out. Thank you for your words, looking forward to the book. Very Good and courageous on your part for exposing this and pursueing it. Keep going forward. I am on the same path and more are starting to come on board! Thanks for stopping by William and for taking the time to comment. It is truly an exciting time to be alive when our questions are finding their way to the light! You have been a huge help in all of this and I'm forever indebted. I'm pretty sure we'll both be around for me to pay up :D. Thanks for all your support on this project and for being my friend. I am very much looking forward to the release of your new book! I'm glad you pointed out that there is a lot to UNlearn, in addition to what we need to learn. So true! The past few years of study have taught me that moving is the only way to grow. What a great point, that Truth is dynamic and living! Got my swim suit on, my Greek Interlinear in hand, and my hell glasses OFF. I'm ready to GO! Another well thought out and I might add , an entertaining post. You have touched a spot in my own reflections, which I have been sorting out, not all of my life, but for the last 40+ years. "What is truth?" is a very simple question. Of course, answering it isn't so simple. 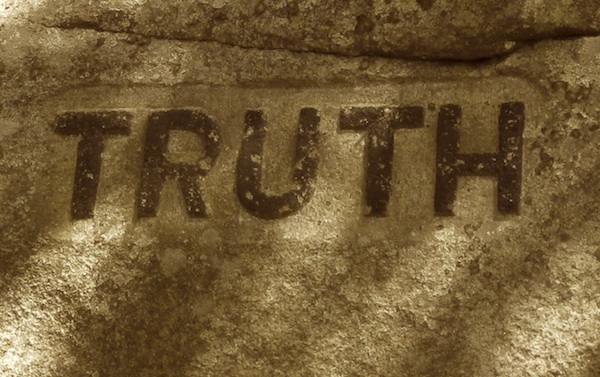 We can offer definitions like "Truth is that which conforms to reality, fact, or actuality." But this basic definition is not complete because its definition is open to interpretation and a wide variety of applications. What is reality? What is fact? What is actuality? How does perception effect truth? We could offer answers for each of these questions, but then we could again ask similar questions of those answers. I am reminded of the paradox of throwing a ball against a wall. It must get half way there, and then half way of the remaining distance, and then half of that distance, and so on. But, an infinite number of halves in this scenario never constitutes a whole. Therefore, it would seem that the ball would never reach the wall if we applied the conceptual truths of halves. The ball-against-the-wall scenario simply illustrates that defining and redefining things as we try to approach a goal actually prevents us from getting to that goal. This is what philosophy does sometimes as it seeks to examine truth. It sometimes clouds issues so much, that nothing can be known for sure. But, even though it is true that an infinite number of halves (1/2 of "a" + 1/2 of the remainder + 1/2 of the remainder of that, etc.) does not equal a whole, we can "prove" that it does by simply throwing a ball at a wall and watching it bounce off. Actually, the "1/2" equation above does not equal a whole — mathematically. The problem is not in the truth but in its application, as is often the case with philosophical verbal gymnastics. "See to it that no one takes you captive through philosophy and empty deception, according to the tradition of men, according to the elementary principles of the world, rather than according to Christ," (Col. 2:8). In order for truth to be defined properly, it would have to be a factually and logically correct statement. In other words, it would have to be true. But, perhaps we could look further at truth by determining what it is not. Truth is not error. Truth is not self-contradictory. Truth is not deception. Of course, it could be true that someone is being deceptive, but the deception itself isn't truth. In relativism, all points of view are equally valid and all truth is relative to the individual. If this were true, then it would seem that this is the only truth relativism would have to offer. But, the problem is that in reality, relativism isn't true for the following basic reason. If what is true for me is that relativism is false, then is it true that relativism is false? 1) If you say no, then what is true for me is not true and relativism is false. 2) If you say yes, then relativism is false. Relativism seems to defy the very nature of truth; namely, that truth is not self-contradictory. Anyway, enough of my thoughts Thanks for this one. Beings that I'm kinda responsible for pushing Julie into the deep end, I better make like a canon ball and join you all as well! Now I know the answer to a game I learned on Sesame Street – "Which of these things is not like the others": 1) Our Heavenly Father is Sovereign over ALL His creation, 2) In a beginning He set forth a magnificent plan to make humanity into His image, 3) His firstborn Son is the fulfillment of that Plan – by defeating death he has been given authority to make ALL subject to himself, each in his own order, as every knee will bow and every tongue will confess 4) Death has lost its sting and Hell is no longer victorious, 5) The majority of humanity will go to hell for eternity. Julie, i'm so excited for the release of your book! can't wait to get my hands on a copy and share it with friends. But we serve a God who is the same yesterday, today and forever isn't it? Truth is absolute and unfaltering. Perhaps what's been faltering is our faith most of the time.